In-form Southend United gave themselves a huge chance of automatic promotion with a superb 1-0 win at Bury on Tuesday night. The Shrimpers drew level on points with third-placed Wycombe Wanderers, courtesy of David Worrall’s 74th minute strike, although the Chairboys remain in the top three thanks to a superior goal difference. Much of Southend’s recent success has been built around a miserly defensive record, with seven clean sheets from their last seven games, winning six of them. The club have gone over 10 hours without conceding, since Abdenasser El Khayati netted for Burton Albion on March 18. Scoring at Roots Hall has been a tough ask for visiting teams all season too, with the Blues letting in a mere nine goals in 22 games in front of their own fans, keeping 15 clean sheets along the way. Stopper Daniel Bentley has been a big part of the success as well recently breaking Mervyn Cawston’s record of 11 shut outs that had stood since the 1980/81 season. Knowing just how vital a game this weekend is for both sides, boss Phil Brown told the Southend Echo: “I don’t normally describe league games as a cup final but that’s exactly what it is this weekend. “If we win it then we have another cup final at Morecambe the week after but we want and need the win this weekend to keep our chance of a top three finish alive. Brown himself is looking to give the club another fillip prior to the game too with signing a new three year deal as he added: “There’s a lot to do in regards to the deal but fingers crossed it will all be done in time for Saturday. Team news: Nathan Doyle is expected to return to the Hatters side, leaving just Mark Tyler, Alex Lawless and Pelly Ruddock Mpanzu as the main absentees, while Paul Benson is suspended. Full-back John White might return from a hip injury, but Adam Thompson’s season has been ended by a dislocated shoulder.Top scorers: Hatters: Mark Cullen (13). Shrimpers: Barry Corr (15). Man in the middle: Iain Williamson - first Luton match of the season for the Berkshire official, who has reffed 16 games this term, showing 48 yellows and one red so far. Last took Luton in the Football League Trophy back in October 2008, a 2-2 draw with Brentford. Has officiated Luton seven other times previously, his first a 3-0 win over Huddersfield in March 2003, while then took a 3-1 home win over Rushden the following campaign, plus the 2-1 win over the same side in the League Trophy, dismissing Sol Davis. His next game was Hatters’ 4-3 defeat at Boston United in the Carling Cup in 2004-05 and then a 2-1 home defeat to fierce rivals Watford in January 2006, sending off the Hornets’ Ashley Young. Town’s most recent away game with Williamson at the whistle was a 5-0 hammering by Ipswich in the Championship during 2006, although he did ref the 3-2 home win over Sheffield Wednesday that season. In charge: Phil Brown 55-year-old who enjoyed an 18-year playing career, making over 600 Football League appearances for the likes of Hartlepool, Halifax Town, Bolton Wanderers and Blackpool. Became assistant boss to Sam Allardyce while at Bloomfield Road, a position he then kept when returning to Bolton under Colin Todd. Following Todd’s departure in 1999, Brown led the team to four wins out of five and then served under Allardyce again for six years, before his first full-time management position at Derby County in 2005. Was sacked after just seven months at the Rams and became first team coach at Hull in October 2006, appointed boss in January 4, 2007. Led Hull to the Premier League via the play-offs and kept them in the division the following season, athough was put on gardening league on March 15 2010 and officially left in June. Announced as Preston boss in January 2011, but left Deepdale in December of the same year and after a period out of football, was appointed Southend boss on March 25, 2013, where he has stayed since. 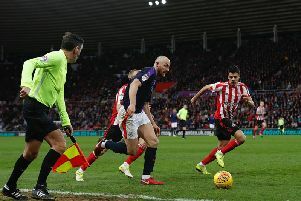 View from the opposition: Southend captain Adam Barrett told the Southend Echo: “We want to win the game and take the promotion push to the last game of the season but Luton are fighting to get into the play-offs so it’s going to be difficult. “But we just have to keep on working as hard we have done and remain disciplined too. Friendly faces: Hatters midfielder Luke Guttridge spent almost two years at Southend between March 2005 and January 2007. The midfielder joined on a free from Cambridge, and helped the Shrimpers top League One to win promotion to the Championship. Made over 50 appearances, scoring five league goals until he moved on loan to Leyton Orient the following season and then joined the O’s permanently. Winger Ryan Hall spent two years with Southend after joining on a free from Bromley in July 2010, scoring 23 goals in 105 games. Finished as runner-up in Southend’s Player of the Year award in the 2010-11 season and achieved more assists than any other player in League Two, before moving to Leeds United in October 2012. Town’s on-loan West Ham striker Elliot Lee was borrowed by Southend earlier in the season, but a hamstring injury in his first training session saw the deal cut short. Boss Phil Brown said: “When Elliot was available for the second time we already had Joe Pigott and Jake Cassidy at the club so we couldn’t really go back for him because we already had enough strikers. One to watch: Barry Corr. Experienced striker has enjoyed a prolific second half of the season, scoring 10 of his 15 goals since January 17. Started his career at Sheffield Wednesday, before spells at Bristol City, Swindon and Exeter until making his move to Roots Hall in 2010, scoring over 60 goals in his time with the Shrimpers. We’ve got form: Hatters have a good recent record at Roots Hall, with five wins from their previous nine visits, although overall, they have won 11, drawn five and lost 17, scoring 35 and conceding 56 goals. Games between the two usually produce results with the last draw coming 18 games ago, back in 1934 when it finished 3-3. Luton’s last win came back in the 2006-07 Championship season when they won 3-1 thanks to goals from Calvin Andrew, Matthew Spring and Besian Idrizaj. Town’s best win was a 3-0 triumph in the FA Cup back in 2004 with Steve Howard (2) and Ahmed Brkovic on target, sewing the tie up before 35 minutes. The heaviest defeat for Hatters is 5-0 though, suffered twice back in 1929 and then also in 1965. Last time out: Town’s last trip to Roots Hall ended in a 3-1 defeat in the FA Cup in November 2008. The hosts led through Junior Stanislas on 34 minutes, but Michael Spillane levelled with 10 to go. However, the Shrimpers won it when Stanislas (84) and James Walker (90) netted. Hatters: Conrad Logan, Ian Roper (George Pilkingon 51), Asa Hall, Sol Davis (Lewis Emanuel 71), Claude Gnakpa, Jake Howells, Rossi Jarvis (Wayne Andrews 71), Michael Spillane, Kevin Watson, Paul McVeigh, Chris Martin. Subs not used: Dean Brill, George Beaven, Scott Sinclair, Gareth O’Connor.